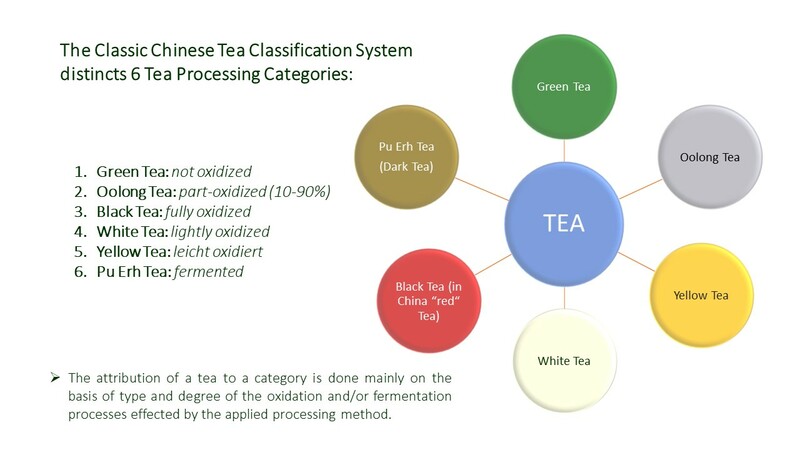 The second subchapter of tea processing begins right where llesson 8/1 ended, with the Chinese 6-Categories Tea Classification System. Although originating from the Chinese tea culture, the system today finds wordwide application. This is not least because to this day virtually every type of tea from every growing region is assignable within this system. At this, the assignment of a tea to a category takes place on the basis of certain processing features influencing type and degree of oxidation of the tea leaves. 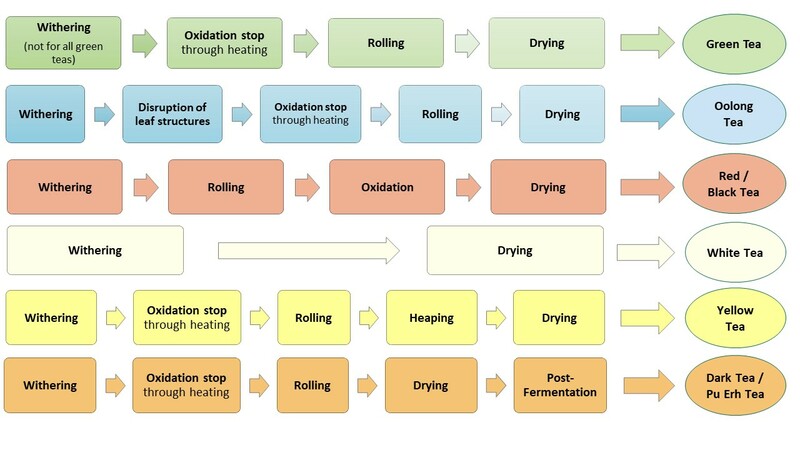 The graph below shows the processing steps for each of the 6 tea processing categories. In particular, the basic differences between the individual processing categories become clear. As a first processing step for most teas, the withering of the tea leaves serves several different purposes. On the one hand, the tea leaf loses water during withering and becomes more supple. This benefits the next processing step, the rolling of tea leaves. On the other hand, withering induces the first oxidation processes, thereby altering and diversifying the tea’s taste and aroma. For example, the withering phase cuts off the edge of a tea’s astringency. With each individual type of tea, the exact way of withering the tea leaves depends on the desired effect. For example, oxidation processes are something that is of limited or no benefit in the production of most green teas. On the other hand, some suppleness of the tea leaves is alwas desirable when it comes to rolling. As the factors heat and air exchange facilitate the oxidation processes in the tea leaves during withering, these factors serve “setting screws” of the desired effect. Thus, withering can take place either “indoor” or “outdoor”, i.e. inside the tea factory or outside in the sun. In addition, for withering the tea leaves can either be spread in a thin layer, for example on large bamboo trays. Alternative to this is their piling up in a withering trough. At this, the differences are obvious. Outside, in the sunlight, the tea leaves experience heat and a high rate of air exchange. In the shady factory building, on the other hand, it is comparatively cool and there is little air movement. And the manner of spreading and/or piling the tea leaves determines how much heat or air reaches each leaf. For some teas, among them all oolong teas, another processing step accompanies the withering of the tea leaves: the breaking up of the leaf structures and surfaces by manual application of force. That is, the tea leaves are swirled, tossed and bruised by hand while still on the withering tray. This can take place with different degrees of force. Here, the spectrum ranges from soft-touch mixing of otherwise largely intact tea leaves to kneading with heavy force. The disruption of leaf structures serves to accelerate the natural enzymatic oxidation. That is, on the one hand, cell fluids diffuse within the tea leaf due to the disruption of cell walls. On the other hand, they emerge on the broken-up leaf surface, where they react with oxygen from the air. Both processes influence the aromatic and flavor properties of the tea leaf. Oxidation is the enzymatic reaction of the juices in the tea leaf with oxygen. Try cutting off a piece from an apple. The effect is well known: where the pulp comes into contact with air, it will soon turn first yellow, then brown. At this, not only the appearance of your apple, but also its taste changes at the repective spot. Something very similar naturally happens to tea leaves after picking. If you just leave them, they turn yellow, then brown. As described above, heat, air exchange and disruption of the cell structures in the leaf and on its surface can accelerate this process. In addition to other reactions, the chlorophyll in the tea leaf is broken down enzymatically, and tannins are released or transformed. For the production of black tea (fully oxidized), this process is left to take its course. In order to achieve the desired flavor result, it is important that the producer can control environmental conditions such as temperature, humidity and air exchange rate during this process. However, the producer can also stop the oxidation process at any point of his choice. The partial oxidation resulting from such termination is, for example, a characteristic feature of oolong tea. Now, let’s go back to the apple example again. While your sliced apple turns brown, the seem does not apply to apple slices on an apple pie. Much rather, the latter will still be white, usually with a slightly yellowish or brownish hue. This is because when baking in the oven, the apple pie is exposed to high heat, which stops the oxidation processes in the apple. The slightly yellowish to brownish coloration of the apple slices already comes about in the time that elapses between the initial preparation of the cake and its insertion into the oven. In tea processing, stopping the oxidation processes in the tea leaf takes place in a very similar manner, namely also through heat. This can take place, for example, through steaming the tea leaves with hot vapor, as is typical for the production of green tea in Japan. In China, on the other hand, the heat is traditionally applied through roasting the tea leaves in a wok over charcoal fire. However, modern tea processing also knows various forms of ovens specifically designed for this purpose. In the context of tea processing, the stopping of oxidation processes in the tea leaf is also often referred to as fixation or “kill green”. In many cases, the rolling of tea leaves already accompanies the fixation process. For other teas, this step follows immediately afterwards. For the processing of some teas, heating and rolling alternates several times. The most classic form of this processing step is the rolling of tea leaves by hand in a wok. Another common method is wrapping the tea leaves in a cloth, the ends of which are then twisted together with great force. The resulting ball then undergoes a process of mechanical kneading, bringing the tea leaves in the desired shape. The most obvious effect of the rolling process, of course, is the shaping. Depending on the type of tea, tea leaves can have a needle-like, spherical or curly shape. In addition to the aesthetic effect, shaping the tea leaves in this processing step also has a decisive influence on the taste and aroma of the finished tea. The force exerted on the tea leaf during rolling ensures that the juices are evenly distributed within the tea leaf. Remaining cell walls and structures opposing this are now finally giving way. Thus, the rolling allows for further, taste- and aroma-relevant reactions between the various substances in the tea leaf. The processing step of heaping the tea leaves only exists in yellow tea processing. After fixing and rolling, the tea leaves are wrapped in paper or cloth, stacked and then allowed to rest. In some cases, they additionally undergo moistening with steam and/or some degree of heating. With yellow leaf processing, the duration of the rest period may vary according to local style and tradition. In any case, the post-oxidation processes that occur during this period cause the tea leaves to yellow. Also, they bring out the special yellow tea taste and aroma. First of all, the final drying step in tea processing serves the purpose of depriving the tea leaves of the remaining moisture. At the end of this process, the residual moisture amounts to about 3%. However, once more, it is not just the obvious that makes this step an important and complex part of tea processing. If the temperature is too high, the tea leaves get “burnt”, which also spoils the taste of the tea. On the other hand, if there is too much residual moisture, there is a risk of the tea becoming stale or even moldy. Particularly important is the period the tea leaves need to reach the desired drying temperature. The shorter this period, the less taste-changing processes take place in the tea leaf. And conversely, the slower, the stronger the process’s influence on taste and aroma. Furthermore, of course, the selected drying temperature itself and the duration of drying are crucial factors. During this phase of processing, the tea leaves for example develop the roasting aroma that is so popular with many teas. At this, the balance between a pleasant roasting aroma and a “burnt taste” is always a difficult balancing act for the producer. A final sorting run often follows the processing of tea leaves. This is especially important where the aim is to achieve perfect final quality. Of course, a first sorting takes place already with picking. Nevertheless, it often happens that individual tea leaves have suffered failures during processing. For example, a tea leaf may have recieved overheating by unfortunate positioning during drying. Traditionally, the sorting out of such failures takes place by hand. However, there are also special machines for this purpose today. These, for example, can recognize deviations in color, enabling them to “separate the wheat from the chaff”. Some teas are not – or not completely – ready for your cup even after processing. In particular, pu erh tea or “dark tea” requires a ripening period for refinement. However, such ripening is not enzymatic oxidation process as above, but rather a fermentation process. For dark tea / pu erh tea, the duration of such ripening process is virtually unlimited. The longer the ripening, the tastier – and more precious – the tea becomes. Accordingly, after ripening under controlled conditions over many years or even decades, a pu erh tea can virtually score its weight in gold. That much for the overview… In the following 6 lessons, we will take a closer look at each of the 6 processing categories.